This is me. It was Christmas Eve 2012 and I had to excuse myself to “lay down”. My nieces were baking cookies, singing songs, dancing around to Christmas music downstairs. My heart desperately wanted to get up and join them, but I couldn’t move. I felt terrible. My blood felt like it was full of lead. A fatigued feeling radiated from my heart. I felt like I had a fever, but I didn’t. My body ached. I just didn’t feel good. I wondered if I looked as bad as I felt so I snapped this selfie. My face looks grey and swollen, my eyes tired. This picture perfectly illustrates what life has been like for me for the last 13 years. Feeling caged and badly beaten by my own body. In 2017 I learned I have ME. I fit into the moderate category. I do any little thing for more than 7 minutes (I realize this is more than most people reading this blog!) BAM. Punished by my own body. Inability to move, lead limbs, and painful aches. Buzzing in my arms and legs, and such nerve sensitivity that any light, sound, or touch feels like someone is banging cymbals next to my head. Someone compared ME crashes to how a person with AIDS feels weeks before they die. I have never had aids, but I certainly feel near death in a crash. Sometimes I wish whatever is causing ME to swallow me up, put my out of my misery. But-not yet. I was often sick as a child and every year contracted strep, bronchitis, and stomach flu. Despite frequent sickness I was very active and participated in local soccer, choirs, and was always in the school productions. My senior year of high school I also served as the president of the student cabinet/service organization. I loved to run and ran at least a couple of miles daily. In 2005 when I began feeling more tired than usual. I was 20 years old. I went to the Doctor and they did a blood panel on me. Everything was normal. Suggested depression medication. I refused. I wasn’t depressed, I was just tired. My belief now is perhaps I was anemic and as a result my thyroid was on the fritz, but we will never know for sure. I spent some time traveling around the world and loved every second of it. The picture to the right is a childhood picture of my sister, brother, and I on Halloween circa 1995. Pictures below: The Colosseum Rome Italy and Toledo Spain. About a year later I left on my church service mission to Jakarta Indonesia. In my church service missions last for a year and a half. I was excited to go despite being kinda tired all the time. I was told it was nothing was wrong so I convinced myself it was in my mind. A couple months into the mission I started experiencing major fatigue. I would get up and about two hours later I would be so tired it almost hurt. I also started getting really thirsty all the time (a problem that has not gone away). My heart started to feel like it was heavy and I would drag myself through each day. My head hurt from all the anxiety I was experiencing of learning a new language and culture and being sick. I came down with things I had been immunized for like the German measles and typhoid fever. Things I had been immunized for. I even began to lovingly name the bugs I was sure were in my tummy. Frank, Larry, and Joe were sure having a good time down there.. haha. 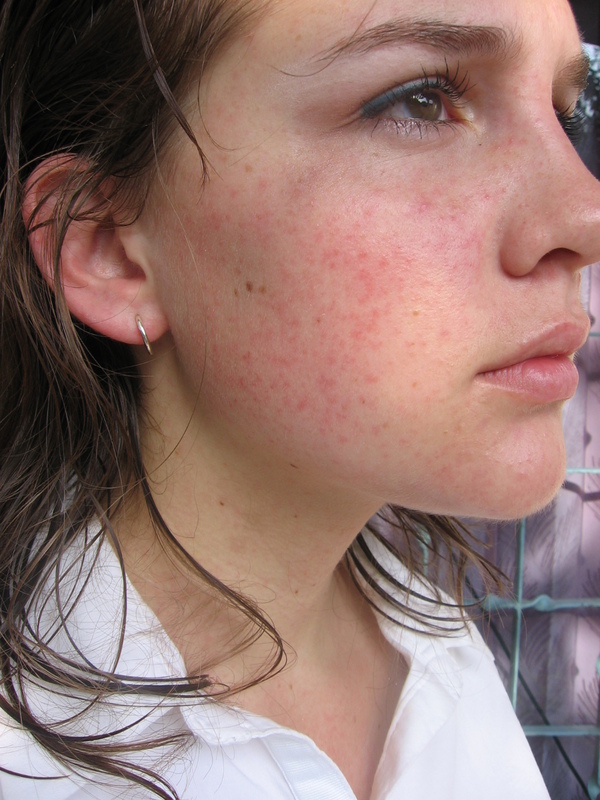 The picture on the right is when I had the German Measles. My whole body looked like that! eeek! I went to the international doctor in Indonesia many times, and nobody could seem to figure out what was wrong with me there either. I was told I was “Borderline anemic” and that my blood pressure was low. Other than that everything was normal. It’s possible that I could have had a viral onset in Indonesia but we will never know this either. Overall Indonesia was a really cool place. I learned so much there but was relieved to come home. I immediately went to the doctor. He ordered blood work testing everything he possibly could, metaboic, viral, bacterial infections. Almost every line was checked on that blood order. I was also given a really gross (and probably inaccurate) intestinal parasite test. Not a single. thing. was found wrong with me. According to that test I was fit as a fiddle. So, I went on my way believing again that it might be in my head. I kept sleeping for more than 14 hours a day and being utterly miserable. Thankfully my mom believed me and made me an appointment to see a homeopathic nurse practitioner. She had a special machine that does electro-dermal dialysis. It sends a tiny electric current through you and wherever there is disturbance in the current there is something amiss in your body. Reviews about this machine are questionable, but I was willing to try it. I was starting to be willing to try anything. Above are pictures of me in Indonesia. Left to right: Tangkuban perahu- hiking into a volcano in Bandung Indonesia. Next to a ricefield in Bandung Indonesia. Holding a leopard in Bogor Indonesia. Yes- that is a real leopard! Sadly it was very drugged. Finally I had some answers I could live with. Her test showed positive for Epstein Barr Virus. I also tested positive for parasites in my kidneys, stomach, bladder, liver, and intestines. She gave me a whole bunch of herbal remedies and sent me on my way (see pic below). It actually seemed to help a bit! I wasn’t sleeping so much anymore, but for some reason, I still felt sick sometimes. Unfortunately I wasn’t ever able to see this RN again. So many people wanted to see her her schedule was backed up for months at a time. It was expensive to get in and I didn’t have any money. I went to see other homeopathic doctors and it hasn’t been the same. I began to find they had no answers for me either. I continued on my life journey. I dated, managed to go to university, worked at an elementary school, felt sick on and off. During this time I believe my ME was mild/moderate depending on how much I did. It continued to slowly get worse and worse. I kept being told nothing was wrong with me. I kept pushing through. I began to give into the notion it might be in my head and I began to take antidepressants. They didn’t help. I pushed through each day, crashing in the evening. Doctor after doctor. Test after test. Year after year. Nothing, nothing, and nothing again. I wanted to give up but I knew something was wrong. I was in my 20’s, I ate healthy, slept enough, exercised. I should have felt great. But I didn’t. One day I was trying to do my daily exercise when It felt like my heart literally broke. I was crawling on my hands and knees. I told this doctor my story and what had happened. After going to the hopsital because of heart attack symptoms an EKG he told me that because I am a health education specialist I had become basically a hypochondriac thinking I had all of the diseases I had studied about. He also told me that “fatigue” was not a defining symptom. You better believe he heard it from me! Finally I graduated from the University with a degree in Public Health Promotion and got my first official job as a community health education specialist (ironic right?) in Arizona. After I moved to Arizona I met a new friend who was about my age and had full blown Lyme Disease. She recommended I go see her doctor in Arizona, Dr. Scott Fry. He was more attentive to mysterious diseases and was able to begin her on treatment for her lyme disease. He listened to my story. He told me he didn’t know everything and didn’t pretend to and he actually went and did some research. He looked up tropical and infectious diseases in Indonesia. He ordered the most detailed blood panel I have ever had- even more detailed than the well meaning doctor I had first seen upon returning home from Indonesia. He also took a special blood sample for testing in his own laboratory. His belief is that illness like MS and Sjogrens Syndrome don’t just happen. He believes they are a result of having mucus producing protozoa in your blood. He was gathering up the evidence to prove it. He put my on absurdly high doses of antibiotics and an antimalarial. At this point I was really excited. He listened to me. He didn’t think I was crazy. His explanations made sense with my history and my symptoms. I picked up my prescription and started on them right away and I actually felt better… for a few days. I tried to remain optimistic but the entire year and a half I was on antibiotics and antimalarials was mostly misery. The high doses messed up my digestive system and made me severely depressed. 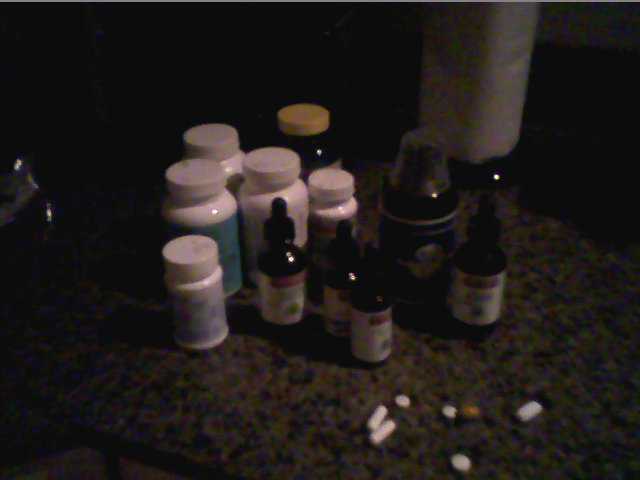 I believe now that it did do damage to my body overall, but they were also holding my immune system together in a way. Weening off of the antibiotics was really hard and messed up my thyroid. I finally tested low enough to go on thyroid medication. The post exertional malaise got really bad and my health went WAY downhill. Below are some pictures from Arizona. toms became moderate bordering on the severe category. In 2016 I found a guy who was willing to marry me despite my health issues (poor guy didn’t know what he was getting into, haha), and also found I had uterine fibroid tumors. So within a matter of three months, I had major surgery to get rid of the fibroids, got married, and bought a house. I’m not sure if it was the extreme stress that did me in but in October 2016 I caught another cold, and was sick for the entire winter. I slowly became totally unable to work, shower, … anything really. I watched downton abbey and that was pretty much it. I couldn’t exercise or be out more than 3 minutes without severe consequences. I was at my whits end. I have tried what feels like every diet on the planet. Vegan, vegetarian, gluten free, candida cleanse, dairy free, leaky gut diet, autoimmune paleo- no luck. I do feel a little better avoiding gluten and dairy, and eating high levels of protein, but it’s nothing to write home about. I might write a blog post on this later, If I have the energy- haha. Slowly I weaned out of my full time job to part time, then to very part time, then not at all. Finally, in November 2017 I received my diagnosis. Myalgic Encephalomyelitis. Relief and terror are the only emotions I can remember feeling with this diagnosis. I told Dr. Holladay about my adventures overseas and he thought putting me on antivirals might be a good option. So, I did. Antivirals actually helped me! I feel like the antivirals and a few other things have boosted my base health a bit- I think I will post about this later. My PEM is still in full swing when I do too much, but if I don’t do much I am usually ok to sit up for hours and even go somewhere every now and again. I consider myself lucky to not be bedridden, and I have seen slight improved since then to a degree with the help of a few specialists here in Utah. I would be happy to send you their info if you are in the area. Since getting my diagnosis I have been trying to learn how to live a full life while having a debilitating illness. I have also been chosen to participate in the CT38 trial. I will update how that is going in blog posts in the future. I want so badly for it to work, not just for me- but for my friends who can’t get out of bed. Anyway, if you are still reading I want you to know I am praying for you. I believe you. Hang in there one more day. Please write to me about your story! Let’s commiserate together! bushjackie16@gmail.com.